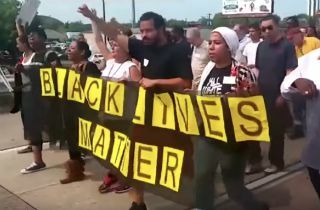 Thanks to the bogus Black Lives Matter Movement spreading over America like a contagion, a white high school teacher has become empowered to lecture his students that all white people are racist. Norman Oklahoma school district Superintendent Joe Siano has yet to take any action against the teacher. But you can bet if the teacher told the class that all black people were racist, Siano would have fired that teacher on the spot. But this teacher was smearing whites, so it’s perfectly okay in President Barack Obama’s supposedly post-racial (hate white people) America. The student who recorded the teacher’s remarks said she did it because she thought it was hate speech. “You start telling someone something over and over again that’s an opinion, and they start taking it as fact,” she said. She’s exactly right. When the mainstream liberal (apologies for the redundancy) media, Obama and Democrat presidential candidate Hillary Clinton legitimize the BLM movement, the liberal logic that follows is that white people are racist. Morning noon and night, liberals talk about racist white police officers hunting down black men as if it is epidemic, but it is NOT. For example, during his remarks at the memorial service for Dallas police officers killed by an armed racist black man, Obama criticized police departments as incubators of bigotry. Like the young girl said, if you keep repeating something, you can brainwash people into believing anything. It began in the halls of academia on college campuses, and it has now trickled down to high schools where teachers have license to poison young minds to hate white people — and/or instruct white students to hate themselves. Liberals love diversity of thought and free speech until they have to practice it. In the name of BLM, black college students with trumped-up racial grievances can demand black-only dorms, safe spaces, and that millions of dollars are donated to their causes. But if white students wanted to create any kind of racial or ethnic pride group on campus, liberals would howl about racism and demand the group be shut down. In supposedly post-racial America, the rule ought to be that both groups are labeled racist and shut down — or all groups are allowed to exist and be funded on college campuses. No more double standards. It’s really that simple. Back to Norman, OK: if Superintendent Siano is committed to ensuring inclusiveness of thought at the Oklahoma public school, he ought to hire a teacher who instruct kids that all blacks are criminals and another who tells them all Hispanics are illegal aliens…you know, to balance out the bigotry. Crystal Wright is author of the newly released book Con Job: How Democrats Gave Us Crime, Sanctuary Cities, Abortion Profiteering, and Racial Division. By day, Crystal is a communications consultant and editor and publisher of the blog Conservative Black Chick.